Today, we went and mailed packages. I just used big brown bubble envelopes and I had eight of them. It cost more than I thought they should but they are mailed. Will they get there in time for Christmas? I don't know. I just know I finished sewing last night and mailed them this morning. My family knows that sometimes I am slow at getting things done but I think I am finished this time. I have one more thing to mail but I'm not at all worried about getting it there for Christmas. So, it will get mailed when it gets mailed. So, am I finished. I still have one and one half sock monkeys to do. I have all the machine sewing done on the first one so I can take all the pieces parts to the farmer's market with me tomorrow and work on it there. Then, maybe I can do the other one tomorrow night and finish it on Saturday morning. It's been cold or raining since Thanksgiving so we haven't been able to set up at the farmer's market. No one in their right mind would stop anyway in the cold and rain. Yesterday when we stopped at the thrift shop I bought more material. As I was wandering around after, I found this green board on legs. I stopped and thought about it and bought it. They didn't want too much for it. 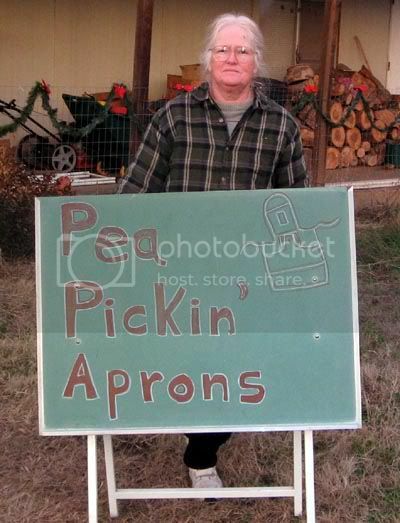 We brought it home and I lettered it to say, "Pea Pickin' Aprons." We will set it out by the side of the street where people going past can see it. When we were at the Christmas Party for the Writer's Guild on Tuesday night some people said, "Oh, we saw those aprons there but we didn't know it was you!" Now they know it, we shall see if they stop to look. I'm hoping some other people will stop and buy something. It's supposed to be sunny and 65 degs. I don't think that's too cold to stop and walk around outside. So, some things are done. I have things bought for Christmas dinner and I actually bought dr a present. Of course, he saw me checking out and wanted to know what I was buying. He approved so I can wrap it up knowing he won't be taking it back. Maybe one day next week we will go shopping again and I can find something else. I still don't have cookies made but we don't need cookies and if I don't get them done it will not be a great loss. So, I'm going to relax and go at a slower pace now until Christmas. I do want to go to the Second Hand Book Store but that too can be done anytime. So, can I be finished, please? I'm glad you got finished and I do like your new sign. What a good posting, Dooley! I enjoyed reading this so much. That board you bought looks good and the lettering is easy to read (also from afar, I suspect). it was nice to draw an image of one of the aprons up in the right hand corner. I hope that you can sell lots and lots of those clever gardening aprons. Chapeau for coming-up with that original idea. Good luck with the gifts--I hope that you are all done now. Fingers crossed for you. What a find!! That green board must have been meant to follow you home - looks splendid now it's lettered up - just right. Maybe now you're (almost) finished you can take a break and have a well deserved rest Dooley. I always enjoy your blog, Dooley... so newsy and casual. Yes! You can be finished and I'm glad you will now be able to relax and enjoy a slower pace. I like the board too and hope it brings you lost more attention for your aprons. And BTW, I love sock monkeys too! Enjoy your day -- hoping it will be rain-free. Santa's elves could learn from you about how to stay busy! I think you've earned some time off to enjoy yourself too!